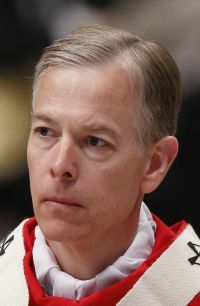 PORTLAND, Ore. (CNS) — As a young California woman gained national attention for her plan to use Oregon’s assisted suicide law, Archbishop Alexander K. Sample of Portland issued a statement saying the Oregon law puts forward illusion and confusion. At the start of 2014, newlywed Brittany Maynard learned she had brain cancer. A few months after she underwent two surgeries, doctors delivered the news that the cancer had returned and that most patients die from such tumors in about a year. She decided against further treatment. Maynard, 29, and her husband moved to Oregon, ostensibly to become legal residents of the state and thus able to take advantage of its assisted-suicide law. She had planned to take a legal overdose after her husband’s late October birthday, on Nov. 1. Now, though, according to CBS News, she wants to wait and see how the disease progresses. In an essay for CNN, Maynard said she had considered hospice care but opted instead for assisted suicide. In late October, she and her husband visited the Grand Canyon. It was the last item on Maynard’s “bucket list” of things she said she wants to do before she dies. “I want to die on my own terms,” Maynard wrote in an October blog post. She announced her plans on YouTube and became a spokesperson for Compassion and Choices, the pro-assisted suicide group that emerged from the Oregon debates of the 1990s. Archbishop Sample said the church stands in solidarity with people who are suffering and dying and with those who are struggling to find meaning in life. In the statement, offered just before the feasts of All Saints on Nov. 1 and All Souls on Nov. 2, the archbishop said assisted suicide offers the illusion that humans can control death. In 1997, Oregon became the first U.S. state to allow doctors to prescribe lethal overdoses. Four other states have since passed similar laws. Assisted suicide “sows confusion about the purpose of life and death. It suggests that a life can lose its purpose and that death has no meaning. Cutting life short is not the answer to death,” Archbishop Sample added. “Instead of hastening death, we encourage all to embrace the sometimes difficult but precious moments at the end of life, for it is often in these moments that we come to understand what is most important about life. Our final days help us to prepare for our eternal destiny. Langlois is a staff writer at the Catholic Sentinel, newspaper of the Archdiocese of Portland.